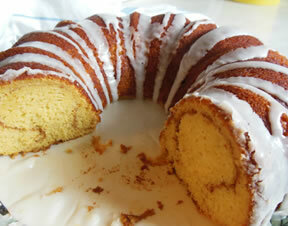 A super moist Bundt cake that you will love sharing with family and friends over a warm cup of coffee. 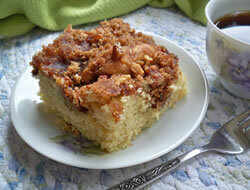 An added bonus to this cake is that it is made on the lighter side using applesauce rather than oil. Grease inside of Bundt pan. Preheat oven to 350 degrees F.
Mix the sugar and cinnamon together. Sprinkle 1 tablespoon of the cinnamon and sugar mixture in the greased pan. Set the remainder aside. 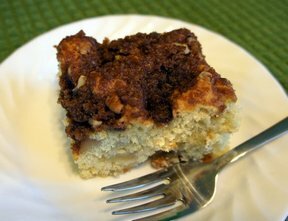 Blend together the cake mix, applesauce, and eggs; beat for 2 minutes. Pour half the batter into the greased and sugared Bundt pan. Sprinkle the remaining cinnamon and sugar mixture over the batter in the pan. Pour in the rest of the batter. Bake in preheated oven for 30 to 35 minutes. 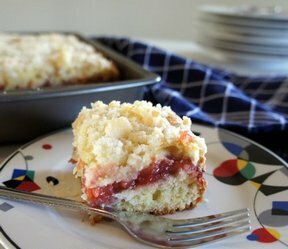 Remove from the oven and allow to cool for 10 to 15 minutes and then remove from the pan by turning out onto a cake plate. Allow to cool completely. Mix the powdered sugar, milk, and extract together until smooth. Adjust amount of powdered sugar or milk to get desired consistency. Drizzle over the cooled cake. "I love finding super simple recipes that turn out so delicious. Thanks for the recipe! I will be keeping this one as one of my favorites."